If I were more charitable, I'd say this aged poorly, but I don't think that's the case. Instead, I suspect this was always boring. The series is about a successful New York attorney who moves away from the city to try and live a simpler existence as a farmer. He drags his wife along with him - she's a wealthy Hungarian immigrant who wanted to stay in New York. The show mainly uses her as comic relief, portraying her as a dimwitted fool, but at least she had the common sense to want to stay put. I've lived in New York, and it's far better than the dump they ended up in. This episode is about the husband, Oliver, wanting an old-fashioned Christmas. That's the title, premise, theme, and most of the plot synopsis. 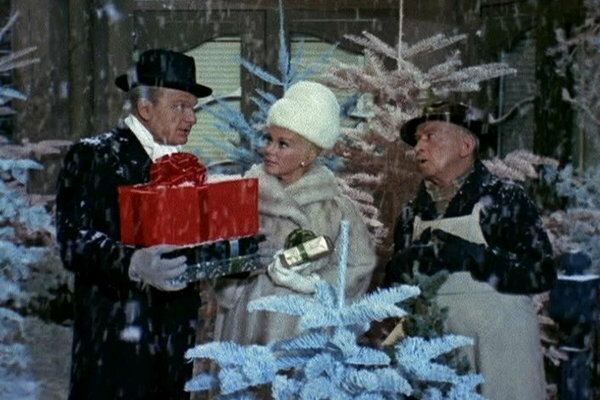 It opens with the couple shopping for a Christmas tree in New York a few years earlier. This is done mainly to establish that Oliver wants an old-fashioned Christmas, complete with a real, old-fashioned Christmas tree, unlike the flocked and/or painted ones being sold in the city. Okay. I get it. This is meant to be a satirical exaggeration of the changing holiday landscape. It's still not funny: there's no depth or subtlety, so it just comes off as someone repeating the same joke over and over again for a few minutes. Get used to the pattern: it's repeated several times throughout the episode. After this intro, we jump ahead to the present (well, present circa 1966), where Oliver is trying to make good on his goal of having a real Christmas tree he cuts down himself. But a traveling salesman tells him there's a law against it. He's skeptical, but he goes into town to investigate. Meanwhile, his absurdly stupid wife tries making a fruit cake using a whole pineapple and other uncut fruit. That's more or less her plot arc for the episode. Oliver asks some people in the local store, who refer him to a government employee. I should probably add that everyone's baffled as to why he'd want a real tree: they're all using plastic ones. After an annoying conversation with the government employee, he's told he'll need a permit, which he gets. And that's it for the main plot. No real conflict, twists, or difficult choices. Government bureaucracy won't allow him to cut down a tree on his own land. Not without a permit, which he gets seemingly free of charge. So glad I wasted a half hour on that. Well, not quite a half-hour: first we get the resolution. A bunch of the characters we've already seen get nostalgic for the old-fashioned Christmases they knew when they were young, so they visit to see the tree. Then they're scared off by the fruitcake. I was not impressed. The show felt almost unbelievably bland. Like a vanilla cake where the vanilla extract was left out lest it give it too much of a kick. Ostensibly, the show was trying for satire - poking fun at the artificiality of modern Christmas and the backwards aspects of rural living. But it was all too timid to be offensive. Pity. Something offensive would have been a nice change of pace. This was just boring. To be fair, there were a few good jokes around the plastic trees, and the wife's closing gift was kind of a cute touch (albeit entirely out of character, given how stupid she'd been portrayed as before this). But the handful of decent lines could barely distract us from the rest of the episode, which was defined by cheap, humorless jokes punctuated by a laugh track. This one isn't worth your time. It's one of those shows civilization would be better off forgetting. Turns out, there's quite a lot of those.